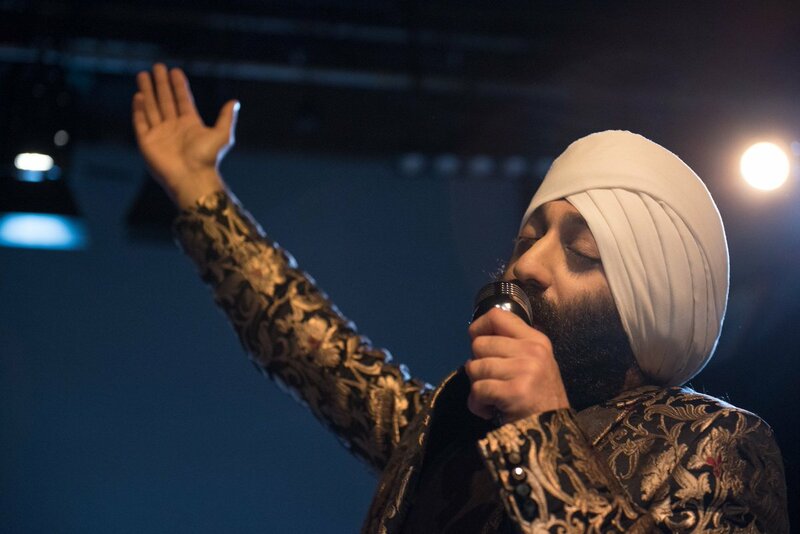 TWO unlikely pop legends from the west led Sub­aig Singh towards a Punjabi music career. The talented singer had gone from learning tabla and harmonium as a child to playing drums and per­forming with swing bands in secondary school, to discovering he had decent vocals with cover versions of Tom Jones and Elvis Presley classics in sixth form. It was later at university while finding himself as a singer that he found a deep connection with tradi­tional Punjabi folk artists and their music. That pas­sion remained and led him toward kick-starting a successful solo Punjabi singing career in 2016. How did you feel when your first song was released? It was a great feeling to be doing something I love and was a dream come true. I got good feedback for that first track including in India, where it was well received. However, I couldn’t have got this far with­out my parents’ support. Needless to say, being a newbie in the music in­dustry, I made some basic errors with the release. However you learn from your mistakes and move on. Experience counts for a lot. I also quickly learned how political the music industry is and how tough it is for new musical talent to break through. What led you towards your single 137 SPEED? Traditional Punjabi folk is my base art and passion. So most of the seven tracks I have released so far have been in this genre. However I have now found the need to diversify and present a variety of genres to cater for different sub-crowds within the Punjabi music industry. In that sense, this is an experimental track and one that differs from the more traditional songs I have released in the past. Tell us about the song? It’s a fast upbeat party song that fus­es Punjabi gidha with modern elec­tronic dance music (EDM). Origi­nally it was called Jattan Di Yaari, but Popsy sug­gested that we call it 137 SPEED as this refers to the actual BPM speed of the song. As usual, Popsy has done his magic with the music. This is a thumping dance tune with catchy lyrics, penned by Laddi Gobindpuri, and one that is designed to set the dance floor alight. Who are you hoping connects with the song? What was the biggest challenge of putting the track together? The challenge is always to get good lyrics and then decide what kind of music would go well with them. Popsy and I have long discussions on what kind of music we are going to go for and we usually agree on things, but it’s not until Popsy has produced the track that I know what it’s going to sound like. When we got this one, we loved it straight away. Popsy himself put a lot of time and effort in the pro­duction, getting it mixed and mastered by some of the best in the field. Then the next challenge was to decide on a video to match the track. Thankfully, Rimpy-Prince, who are the godfathers of the industry, offered us two options and we decided to go for a more modern, urban look. After shooting the video over two nights, the product that Rimpy- Prince put together is truly mind-blowing! It’s a modern urban music video shot in a disused cardboard factory in Ropar, Punjab. It’s got all the jazz! International level break dancers, cars, motor­bike stunts, smoke bombs, lasers, pretty girls, fire stunts, and (laughs) of course myself. The look is modern, the sound is dance and the video is pump­ing. I am very happy with it. Rimpy-Prince have proved their expertise once again. Is this your most ambitious venture yet? It is indeed. It’s definitely the biggest budget music video that we have made to date. My mother and manager Kulbir Kandola was always keen for us to push our videos to the next level and I think that this has been achieved. Are you hoping the song is a turning point? It’s only been a year-and-a-half since I entered the music industry. It has been a very interesting jour­ney. I have learnt a great deal and met some very in­teresting people. I have thoroughly enjoyed every bit of it so far. I’m very happy how things have gone, but no one knows which song is going to be a hit or when that certain turning point will come. You can drive yourself mad trying to chase that one big hit. It’s not good for your mental and emo­tional health, to put yourself under that kind of pres­sure. I’m just gonna enjoy the journey and have lots of ideas we want to try, but it takes time. You can only give your best and that is what I intend to do. What is the plan for the rest of the year? I have two more tracks ready to be released. I’m working on a number of other projects which hopefully will take fruit this year. The plan is for each one to be bigger and better than the one before. This is a pas­sion and I’m on the case all the time. I have a very talented and supportive team for which I’m grateful. I just hope the fans will approve. Is India on the radar for you? India has been our main market from our very first day. All our releases have been worldwide to date. The UK market is much smaller, and in fact all the various regional markets appear to have merged in­to one big global one with the centre of activity root­ed firmly in Punjab, the birthplace and stronghold of Punjabi music. If we do well in India, we do well globally. It has always been about India for us. You are a man of different talents; where does music fit in? Music is my first love. I find every aspect of it hugely satisfying. I sing in the car all the way to work and back. I never switch off from music. It’s a 24/7 pas­sion and there are no days off. Even when I’m not doing music, I’m doing music! I haven’t given it that much thought. There are lots of singers out there that it would be fun to work with. However as I have so many ideas of my own at the moment, I’m not sure when I would get to doing a duet with anyone. When it happens, I would like it to be with one of my old school idols. If you could ask any living or dead artist a question, who would it be and what would you ask them? I’d ask Chamkila if he saw the person who shot him. It’s one of the darkest moments in the history of Punjabi music and a topic that always comes up in conversation. No one knows the answer, but there are so many conspiracy theories. It would be nice to put these theories to rest and find out the truth. My mother and manager Kulbir. Her determination to see me succeed, even when I have sometimes felt like giving up, is what drives me to go on. What are you hoping is the future of British Pun­jabi music? I’d like to see a resurgence in folk music and greater promotion of the Punjabi language, culture and val­ues in both songs and music videos. Currently Pun­jabi music is being taken over by hip-hop and Pun­jabi lyrics are being steadily replaced by English language ones in our songs. Experimenting with other musical styles is great, but I think we are suffering a sad decline and losing that which is our own. I think we owe it to our fu­ture generations for them to know their roots. We have such a rich culture and history that it would be a shame to see it lost. What would you change about the industry? Less politics. Less pettiness. Less tribalism. More love. More consistency. More mutual support, co­operation and respect for each other’s art. There is room for everyone. What music dominates your own playlist? Dhadi! Religious folk artists singing stories from Sikh history like Charan Singh Alamgir and Gur­baksh Singh Albela. I listen to a lot of 1980s folk leg­ends like Surinder Shinda and Kuldeep Manak. I know it sounds bad, but I also listen to my own songs on repeat. I guess that is good as I must be making songs that I truly love. Why should we pick up your latest single? Because it’s brilliant and you would be missing out if you didn’t. It evokes every kind of emotion and stimulates the mind, body and soul in every way possi­ble. Every culture has had its own music and style of singing since the beginning of time. Life without music would be no life at all.